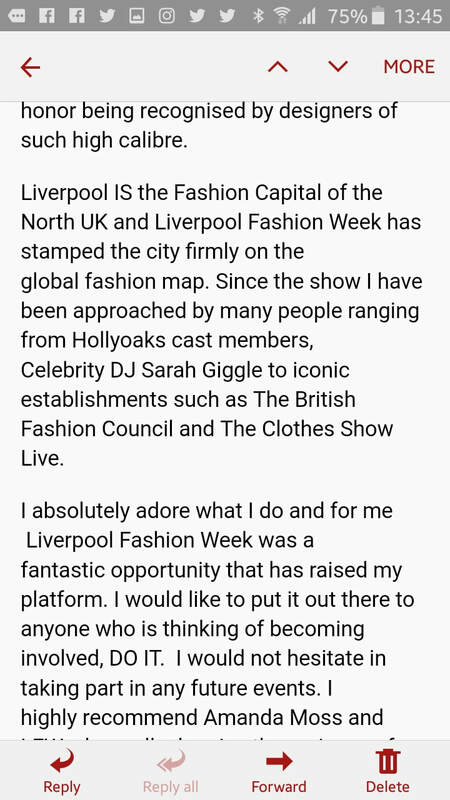 I am very happy that I had the chance to present my collection of clothes within Great Britain and Liverpool Fashion Week was the ideal place for it. Thank you to you and your team for all your support (I feel so bad that I can't remember names, but the main dresser and the young blonde lady who was in charge with the order of the models were extremely helpful). I think the models were again very helpful. All the people who work backstage are professional, they do their job very well, otherwise you can't have a show. I was pleasantly surprised when I saw all the members of the team working together, doing things that I don't think they were supposed to do only to make sure that the models are ready in time for the catwalk and everything goes as expected. It has so much scope to be bigger and better than any other regional fashion show and you should be proud of yourself and everyone who helped out, it was a fabulous event and a great experience for my business to move forward. Sally Ayres, vintage collector. 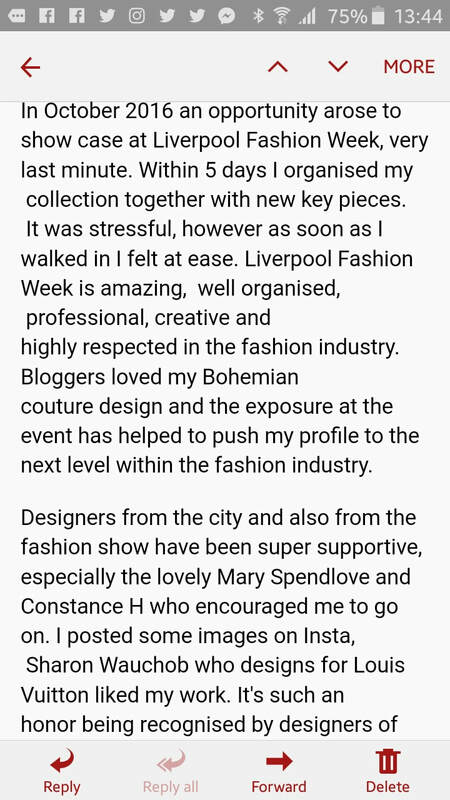 I am a fashion and accessory designer based in Leeds and my working relationship began with Amanda Moss in August 2013 when I applied to showcase at Liverpool Fashion Week 2013. From day 1 Amanda has been extremely positive, supportive and encouraging of my work throughout the process. She has worked constantly on my behalf and been excellent in communicating and liaising with me every single day of our working relationship. I would just like to thank you for my participation in Liverpool Fashion Week, it has opened a lot of doors for myself and my career in the modelling industry. I would like to thank Amanda Moss as without her none of the shows would of ran the way it was so carefully planned to. Back stage would have fell apart as she kept everything and the momentum going. . So my final word toward fashion week would be successful and an enjoyable experience and im looking forward to my future. Hannah Kent, model. work with the Model101 team. was a great opportunity to mingle and meet everyone especially the models. Everything was organized well from the walking rehearsal to the final event!